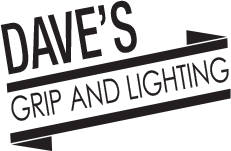 Dave’s Grip and lighting can provide your next production with a 1-ton, 3-ton, 5-ton, 10-ton, or sprinter grip and lighting package. My grip equipment is primarily Matthews Studio Equipment. Very little of my gear is over 5 years old. All of my film and television equipment is in top condition and impeccably maintained by me and my guys. My trucks were personally designed by me with over 25 years of experience working on grip trucks. Our trucks have large lift gates that are safe to operate with manpower and carts riding at the same time. Fast gates mean quick load in and load out, saving on labor costs. 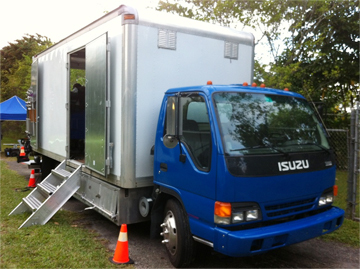 If you do not need a truck we will happily rent you just lighting and grip equipment! We rent the best in film and television lighting. Arri HMI’s, Kino flo fluorescents, K5600 Jokers, Lite Panel Astras LED, Arri Tungsten Fresnels, Litematt — we have it all for rent! We can also deliver your rental and do the set up for you. NO lighting rental is too small. I personally go out on my trucks. If I am not available I have a trusty crew of great gaffers with sterling attitudes to make your life easy! We can refer Gaffers, Key Grips, Grips, Makeup people, assistant cameraman, PA’s, and soundmen. I have been in this market for years and know the best people for your production.